Wow! 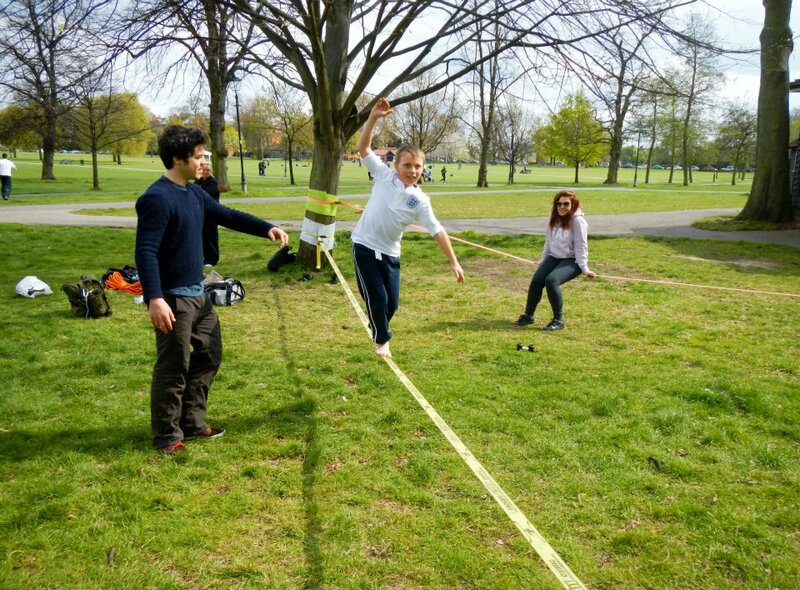 What an awesome weekend for slacklining in London – Saturday 14th April was the official launch day for SlackClapham; a free slacklining club held weekly on Clapham Common. I’ve only been living in London for 4 weeks, but with a passion to provide a balance outlet for the local community and some help from slackers the world over, I have managed to get one club up and running quickly. It was a chilly day, but members of the public still came from all over the greenery to check out the array of levitating equilibristas. Yet again, “Man On Wire” became a source of conversation, as did the brief history of slacklining for those who had never witnessed it before. Mothers, Papas and everyone in between had a go – the concentration faces – turned-grins of satisfaction became contagious! 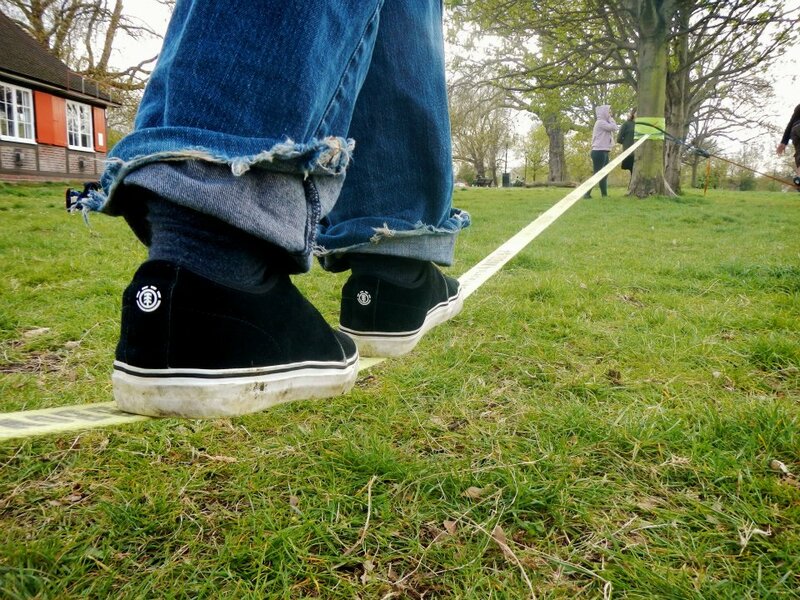 We had a variety of lines set up, all following the Safe Slacklining Guidelines that I have worked with international slackliners and local councils to establish. I was also on hand to help anyone out who was trying to learn specifics. 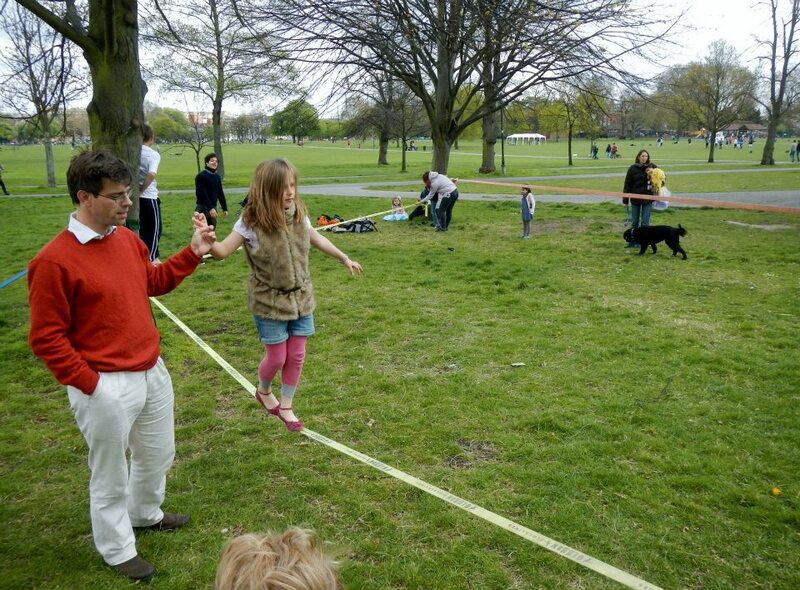 Lucy was quite new to slacklining, so I helped her with some tips for mounting the line and static balancing. And my shining star for the day was Harley, an 11 year old from Peterborough visiting London with is family for the weekend. He had seen Maverick on the CBBC Download show on TV and slacklining had stayed in his mind ever since. Sadly, his Nan said he had ADHD and that he found school very difficult. Well, let me tell you, this dude walked a 10m line in TEN MINUTES. It takes most of my clients between 6-10 hours to do what he did. Attention disorder? What a load of rubbish. His focus was laser sharp, meaning he learnt a skill 60 times faster than the average human. More about this in this post I have written. Big thanks to everyone that came down to make the day. Special thanks goes to Lambeth Council Parks Team, Maverick Slacklines for providing the lines, Chris Jester for providing free tree protection to everyone and for the photos, Lucy for improving her balance in just a couple of hours, Maddy for smashing out her new line, Adolfo for representing Brasil, and especially Harley for proving that human potential is unlimited, and sometimes humbling. Russell Square, Camden Borough, is the next club in progress – the momentum is growing as I have a meeting with Camden Parks Team this Thursday to officially create slackULU (University of London Union). Stay tuned for the opening date! See you next Saturday, 21st April, from 12pm, for SlackClapham by the bandstand and café! 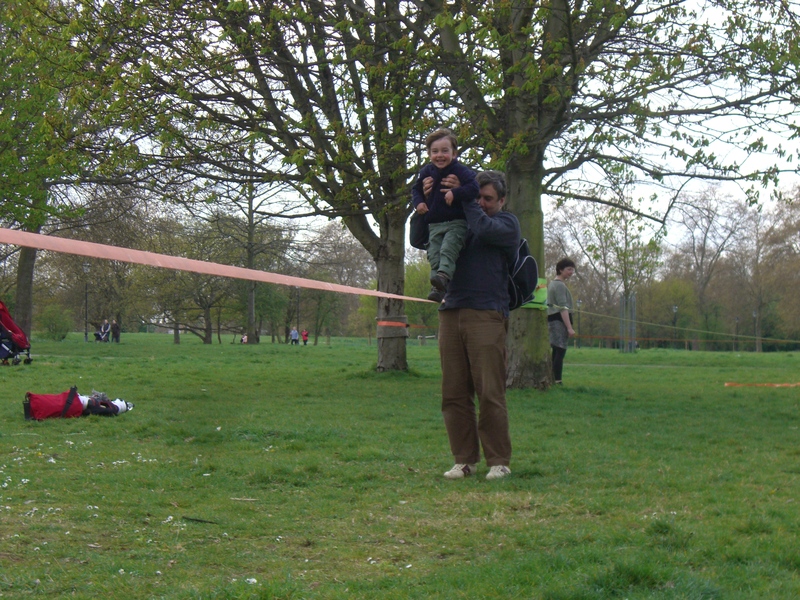 This entry was posted in Events, Slacklining and tagged balance, Clapham Common, free activity, free club, harry cloudfoot, lambeth council, learn to slackline, learning skills to create balance, london, man on wire, maverick slacklines, slackClapham, slackline, slackline classes london, slackline instructor, slacklining, slacklining club, slacklining in parks, slacklining workshops, slackLondon, things to do in london by harrycloudfoot. Bookmark the permalink.